From sublime singing to ridiculously good comedy, this new production is the next big step up for a small opera company. 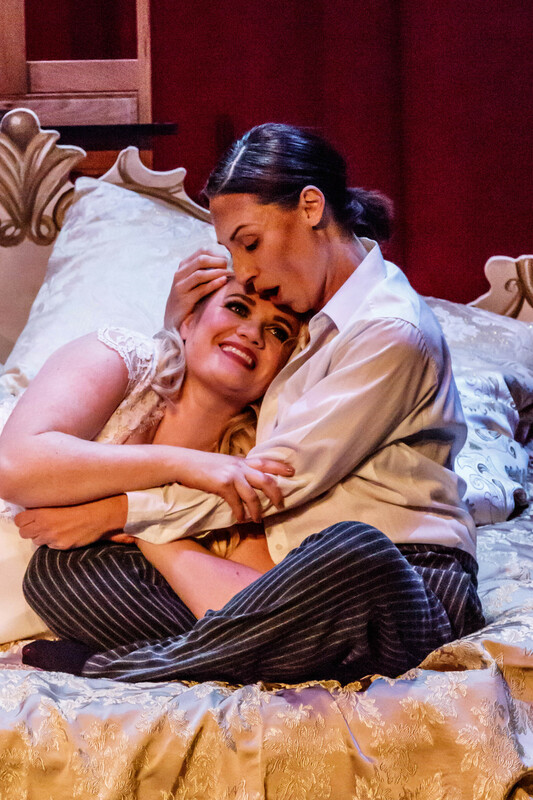 Perhaps more than ever before, Melbourne Opera ticks a lot of boxes with this new production of Richard Strauss’ bedroom farce about love, mistaken identity and the genuine melancholy of youth’s inevitable passing. The most satisfying aspects of this Der Rosenkavalier are the splendid principals, clever direction, and sets and costumes that are often a joy to behold. Not every box was ticked on opening night, but the company’s growing confidence and maturity was apparent in the production’s delicate balance of the sublime and the ridiculous. Der Rosenkavalier, which premiered in Dresden in 1911, begins with an assignation between the Marschallin and her young lover, Octavian. They are interrupted by the unexpected arrival of Baron Ochs, who seeks her advice about who should carry the traditional engagement gift, a silver rose, to his fiancée, Sophie. The Marschallin suggests Octavian, who has disguised himself as a maid, ‘Mariandel’, and becomes the object of Och’s lecherous attentions. Octavian and Sophie fall in love, and she refuses to marry her betrothed when she finally meets the vulgar Ochs. Octavian tricks him by arranging a rendezvous with ‘Mariandel’, and the young lovers’ union is blessed by the sad but gracious Marschallin. Though the amorous scene between the Marschallin and Octavian that takes place during the overture is quite long, it’s one of the most realistically relaxed I have seen at the opera in some time. That the lovers are played by two women perhaps contributes to the sense of ease, especially in the #MeToo era, but it also suggests from the outset that director Tama Matheson has injected confidence into this production. The kissing between Octavian and Sophie is similarly free of that awkward fumbling so often seen on operatic stages (and actually became excessive in the end). 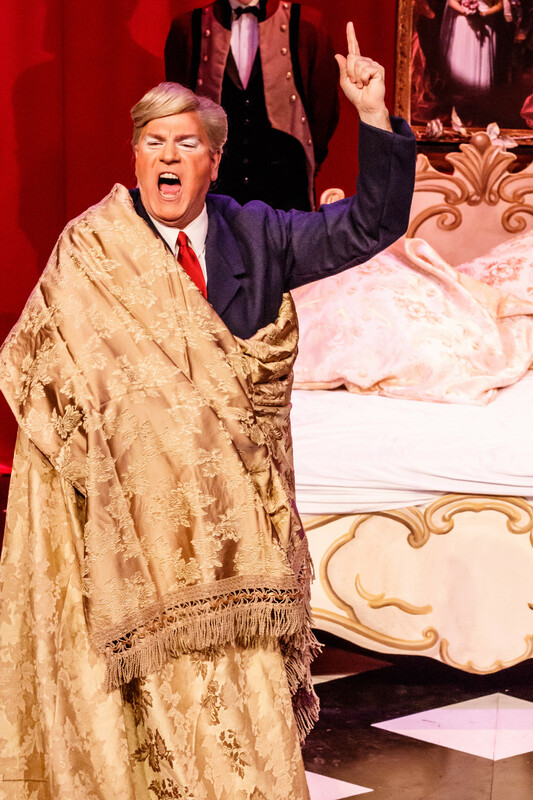 Elsewhere, there is some committed groping, most amusing of all when unexpectedly aimed at the groin of Baron Ochs, interpreted with hilarious Donald Trump references that again point to a confidence, even a daring, that has not been a Melbourne Opera hallmark. Daniel Sumegi often steals the show as Ochs. With a too-long red tie, orange face (with white around the eyes) and bouffant hairdo, he heightens the caricature with an oafish pout and sight gags such as those yank ‘em in handshakes, and a childish display of document signing. Even the English translation (more on that later) seems to lean Trump more than literal on at least one occasion, when Ochs observes that “girls like to be grabbed.” Sumegi clearly enjoyed every minute of his performance, and when he wasn’t in outright comic mode that rich bass was as beautiful as burnished mahogany. Lee Abrahmsen is a majestic presence as the Marschallin, dignified in both her personal regret and public role as a woman of importance. Her soprano is powerful, with lush tone even for those effortless top notes. Danielle Calder is terrific as Octavian, carrying herself with just enough suggestion of a young nobleman, rather than resorting to swaggering, then having fun as the not-so-innocent maid. She sings with lovely clarity – both in terms of diction and the tone of her soprano. Diction is problematic for the third of the principal sopranos, Anna Voshege (Sophie), though her voice has a pure, delicate quality that’s a pleasure to hear. Together, in duets and the bittersweet Act III trio, the triumvirate of sopranos deliver the night’s most sublime moments. Other notable performances include Henry Choo’s Italian singer, a playful cameo that allows him to showcase all the tenor’s artistry, and baritone Simon Meadows, who is assured as Sophie’s father. While the large cast is vocally inconsistent, most, including several non-speaking actors, maintain this production’s comic confidence. The Melbourne Opera Orchestra, conducted by David Kram, overwhelmed the singers occasionally, and some instruments, especially percussion, were sometimes disproportionately loud. These problems are probably difficult to avoid in the little Athenaeum Theatre, and overall their accompaniment was measured, indeed sensitive during serious passages. Perhaps detracting from those serious moments, as well as one’s comprehension of the farcical plot, is the decision to present Der Rosenkavalier in English translation without surtitles. I overheard complaints (including from one audience member during the performance!) about not being able to understand what was being sung. This is a concern, especially if Melbourne Opera want to keep on side with newcomers to opera (who are attracted by the relatively modest ticket prices). 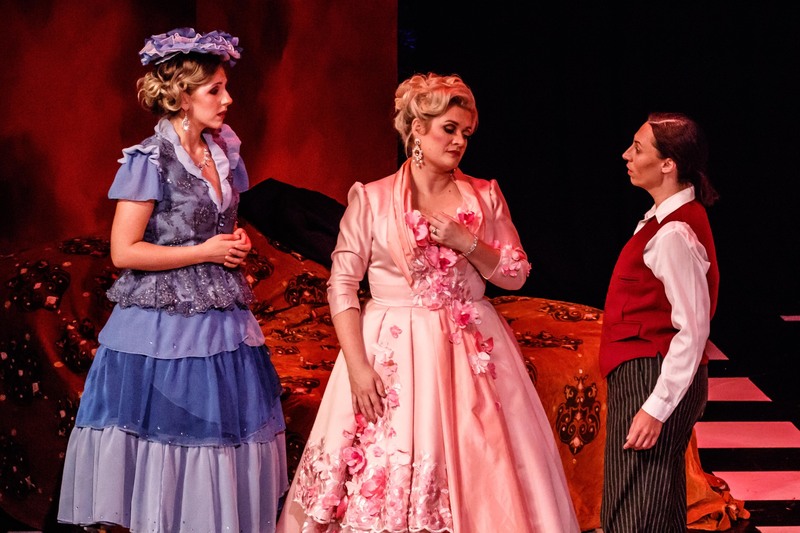 This production’s sets and costumes would surely please both opera novices and old timers, especially when bearing in mind that the company receives no government funding. In the past, tiny budgets were obvious, sometimes painfully so, in these departments. While money doesn’t seem quite so tight these days, the inventive and impressive ways it’s utilised here is testament to the designers’ talent. A highlight of Christina Logan-Bell’s set is the spectacular wall of massive fabric roses seen all too intermittently, but therefore with all the more impact, during Act I. Lucy Wilkins’ costumes suggest a setting around the time of Der Rosenkavalier’s premiere, with some allusions to the original 18th century setting, including wigs for some men. Though there are many, nearly every costume is noteworthy. There’s elegant ostentation (even fleetingly so for the barely glimpsed hairdresser), gorgeous little details such as the embroidery on Sophie’s father’s jacket, and fun elements too, particularly for the Trumped-up Ochs, and the servants’ gorgeous blue wigs. The lighting was much less successful if not in the design then in execution, most notably some very rough transitions. A ghost ship worth catching before it sails away later this week. Rossini’s now rarely seen take on Shakespeare’s tragedy is hampered by the plot’s hollowed out drama. Ahead of directing the Australian premiere of Rossini’s Otello, the legendary director waxes lyrical about the qualities of this overlooked masterwork. A stunning Elektra, Salome and much more, the last great singer of her generation passes at 101. 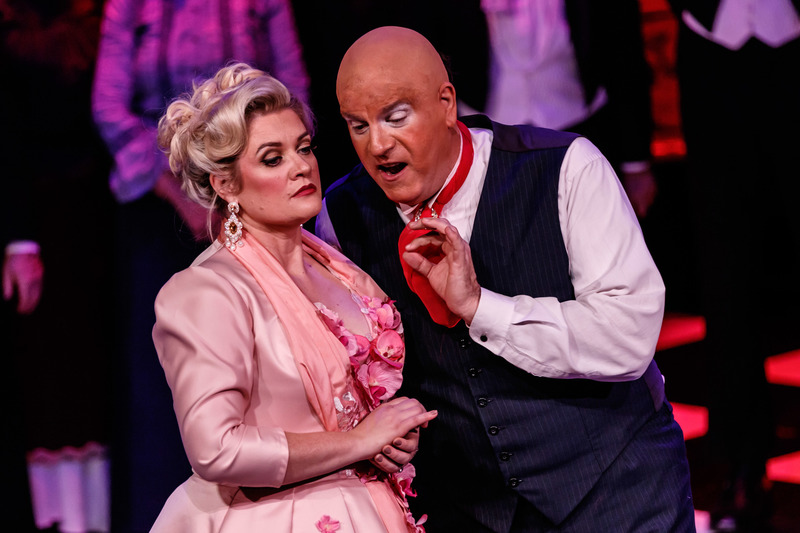 Ahead of his appearance as Baron Ochs in Melbourne Opera’s Der Rosenkavalier, the Australian bass discusses why the role is his very favourite. The six singers will receive performance and cover opportunities, as well as attending workshops dedicated to role preparation as part of the program. Local soprano Lee Abrahmsen leads a handsomely sung but theatrically underwhelming production of Wagner’s tragic love story. Ahead of Melbourne Opera's Tristan, the conductor talks about Bayreuth, finding that extra dimension in Wagner, and the importance of empathy in the rehearsal room. Opening night belonged to Australian soprano Helena Dix in the role of Queen Elizabeth I.
Suzanne Chaundy talks about staging Donizetti’s Tudor Queens ahead of the final instalment, Roberto Devereux.